Portrait of Elizabeth Burgess Harvey. Courtesy of the Mary L. Cook Public Library. 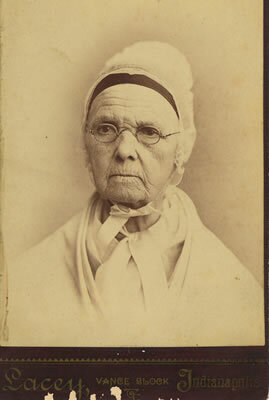 Elizabeth Burgess Harvey was a Quaker and an abolitionist in Warren County, Ohio during the 1830s and 1840s. Along with her husband, Jesse Harvey, Elizabeth was also responsible for founding the community of Harveysburg, Ohio. Harvey was born on September 22, 1801. She eventually married Jesse Harvey, who was seven years younger than Elizabeth. In 1830, the couple moved to Harveysburg, where Jesse opened his own medical practice. Like most Quakers, the Harveys denounced slavery. In Harveysburg, Elizabeth and Jesse dedicated their lives to assisting African Americans. According to the couple's children, the Harvey's home was a stop on the Underground Railroad. In 1831, the Harveys also established the Harveysburg Free Black School, which was the first free school for African American children in Ohio. Elizabeth Harvey was especially concerned about the lack of free education for Ohio's African American children and convinced her husband to construct a one-room schoolhouse to assist African American children in attaining an education. Elizabeth Harvey served as the school's first teacher. While the institution is now known as the Harveysburg Free Black School, the school permitted any children of color to attend. Constructed of brick, the Harveysburg Free Black School remained in operation as a school until the early 1900s, when African Americans were finally permitted to attend historically white schools in the community. The school relied on donations, principally from the Grove Monthly Meeting of Friends in Harveysburg, to remain open. In addition to opening the Harveysburg Free Black School, the Harveys also established a seminary for white children in the community. Elizabeth and Jesse Harvey also actively assisted American Indians in Ohio. While in Ohio, the Harveys made frequent trips to Wapakoneta, Ohio, the home of numerous Shawnee families. In 1847, the family moved to Kansas to work with the Shawneeat a Quaker mission, after their forced removal from Ohio. Jesse Harvey served as the superintendent of the Friends School and Farm for the Shawnee in the Kansas Territory. Shortly after arriving in Kansas, Jesse Harvey became ill. He died on May 12, 1848, less than one year after arriving in Kansas. Upon her husband's death, Elizabeth Harvey continued her mission to the Shawnee in Kansas. She dedicated the remainder of her life to working with both African Americans and American Indians. Harvey eventually married a man by the name of Mendenhall. She died on May 1, 1888.